Meal planning and prep is an easy way to ensure we have healthy options in our house throughout the week. Recently, I’ve started having vegetables ready to go in my fridge to heat up for lunch or dinner and it’s been great to have it already prepared. 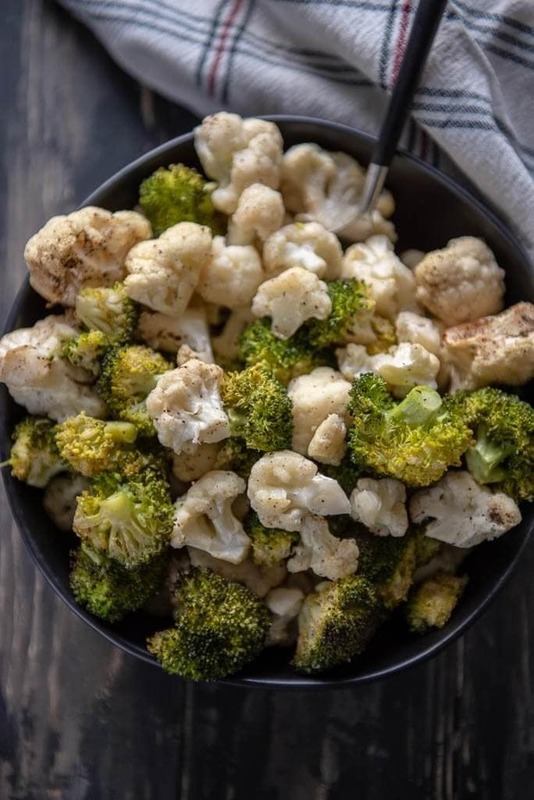 Roasted broccoli and cauliflower is my favorite right now and makes a great side dish! 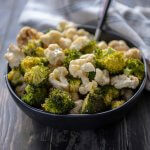 This roasted broccoli and cauliflower recipe is easy, and can be prepared quickly. Vegetables have not always been an easy food for me to incorporate into our meals. For many years I ate vegetables because I felt like I had to. When I stopped forcing myself to eat them because I thought I “should” and allowed myself to enjoy them because of the way I feel when I eat them, it made all the difference! I only buy vegetables I actually like. Do you know how many times I’ve thrown away vegetables because I bought a bunch at the store because I felt like I had to eat them all?? I stopped doing that and started only buying enough vegetables for 1-2 weeks at a time and only vegetables I know we like and will actually eat. Canned and/or frozen vegetables are ok! Don’t buy into the lie that you only have to eat fresh vegetables. I did that for far too long too and felt like if I didn’t buy fresh, it wasn’t good enough. If you have a hard time eating fresh vegetables before they go bad, try buying frozen. I have saved a lot of money buying frozen vegetables instead of throwing away fresh that went bad before I had a chance to make them. Also, I do not like fresh green beans but I love canned green beans… I stopped telling myself that wasn’t a healthy choice and now eat the canned green beans several times a week without guilt. Cut and clean fresh vegetables as soon as you get home from the store. This is huge. Part of the reason so much food was getting thrown out was because they never got taken out of the produce bag. I have started cutting them up as soon as I get them home so they are ready for me to add to any meal throughout the week! Vegetables do not have to taste disgusting and when I allowed myself to experiment I found I really enjoy them much more than I ever had! I love to roast them, sauté them in a skillet, or eat some of them fresh. Here are a few delicious vegetable recipes I have. Give them a try and see if they become a new favorite! Healthy eating shouldn’t feel like something you have to do. If you allow yourself to prepare vegetables in new ways you may find you actually enjoy them! That’s what I’ve discovered and it’s so much easier to incorporate them into my meals when I look forward to eating them instead of “choking them down”! Cutting board– I like the boards that have grip on them so they don’t slide around on the counter, and I also like the juice drip grooves to keep whatever food you are cutting contained onto the board. Knife– I used dull knives for far too long. Now that I have a good sharp knife it makes preparing food much easier! Baking Sheet– I like to use a large baking sheet so if I need to stir the food I’m preparing it doesn’t slip off the sides. 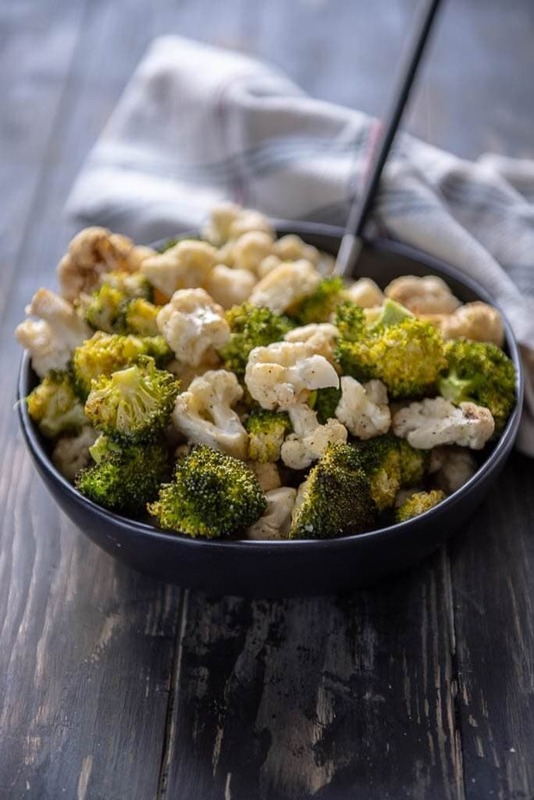 Oven Roasted Broccoli and Cauliflower is the perfect side dish for a meal, or can easily be prepared ahead of time to have vegetables ready for the week! 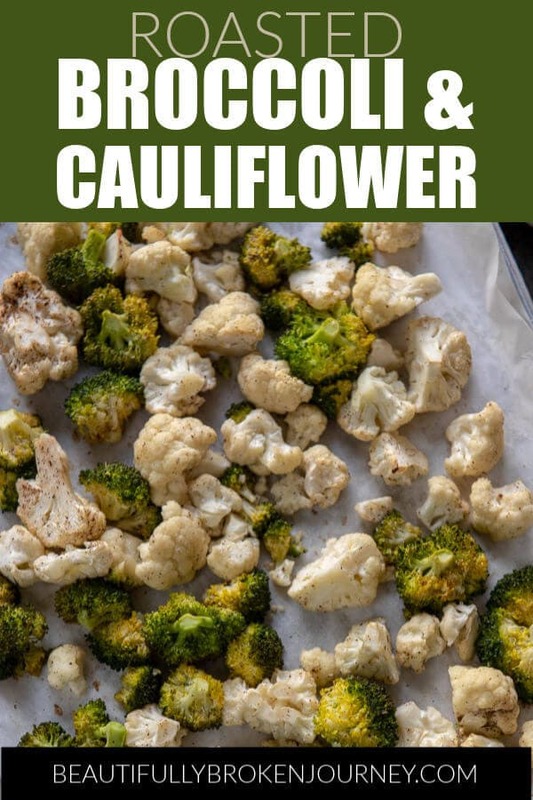 Cut broccoli and cauliflower into bite sized pieces and wash thoroughly. Once oil is evenly coated on vegetables sprinkle salt and pepper (you can add more or less to taste) and mix well. 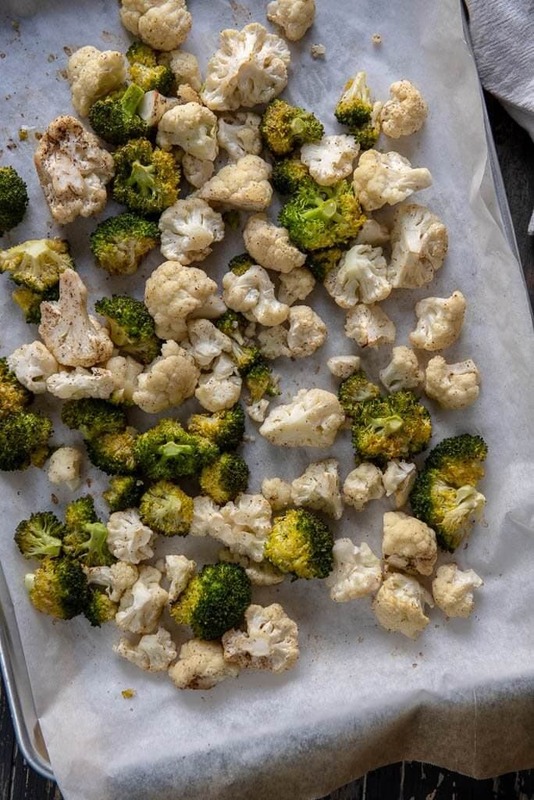 Place vegetables on baking sheet in a single layer and bake for 25-30 minutes. *You can adjust salt and pepper according to your preference. *You can add additional cooking time if you want your vegetables to be more tender.